Below are just some of the testimonials that I have received over the years. Thank you so much for our beautiful ceremony, it was exactly what we wanted and we couldn’t be happier! 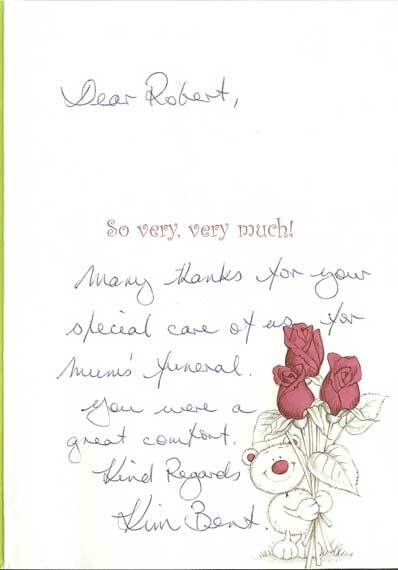 Everyone there loved the way you ran it, we really appreciate your professionalism and calm cheery attitude. 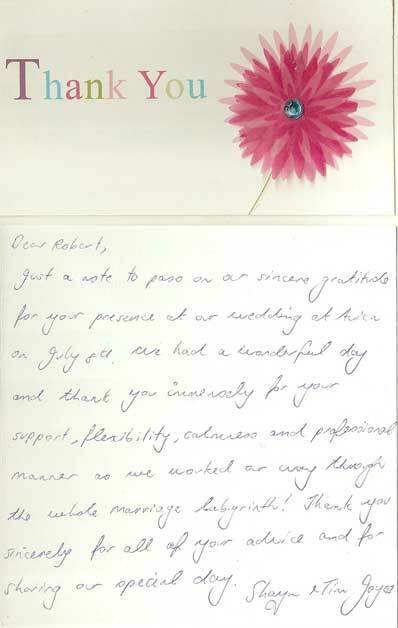 We sincerely thank you for your kindness and support both in the lead-up to and on our wedding day. Our ceremony was everything we could have wished for and we would not have changed a thing. 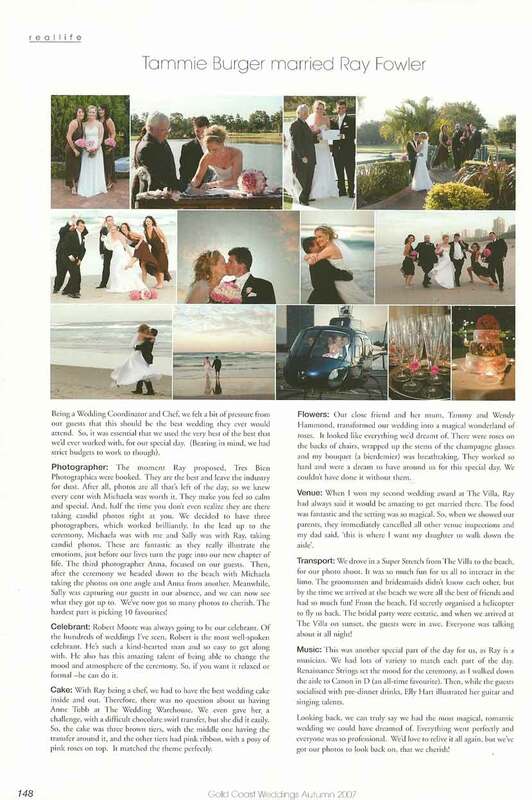 We just got back from our honeymoon and wanted to send you a quick email to thank you for our wedding ceremony. We were really nervous before the ceremony but you made it so simple and beautiful, that it ended up being the highlight of our day. It was also the highlight for many of our guests…. 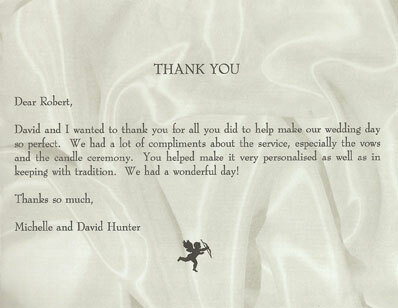 … thank you for all your help on our wedding day. 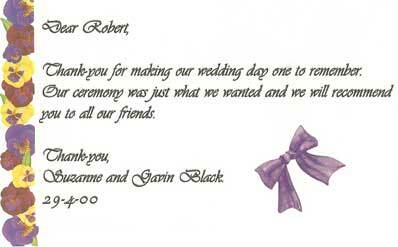 The ceremony was absolutely perfect and everything ran so smoothly – we could not have been happier. 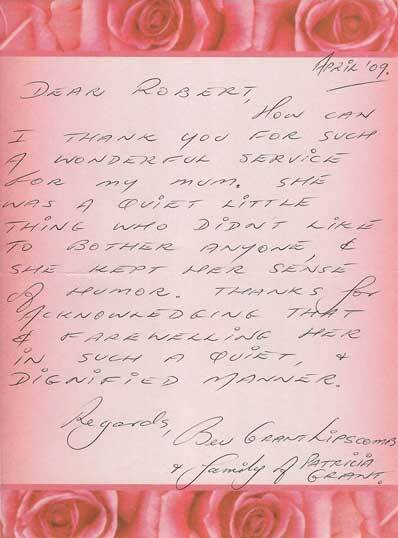 Thanks again – your calmness made a nerve-racking day go just so smoothly – especially with the mix-up with the answering machine, & my daughter being undecided about singing. You were such a help. 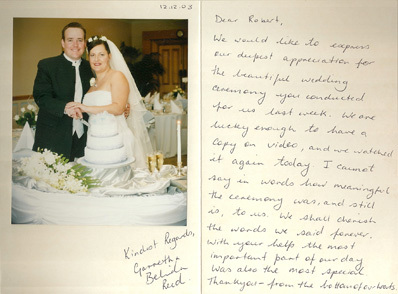 Just a little note to say thank you for your help leading up to our wedding & for doing such a wonderful job on the day. 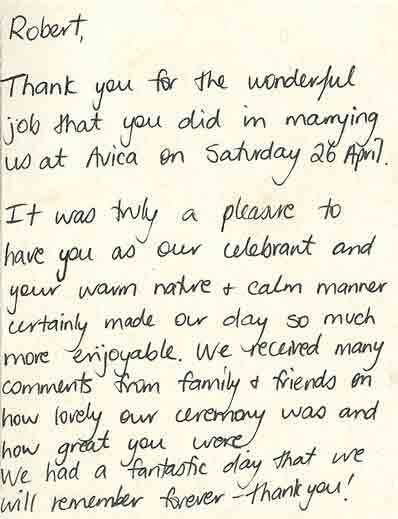 You helped put everyone at ease & made sure all ran smoothly on the day. For this we are very grateful! Thanks again. 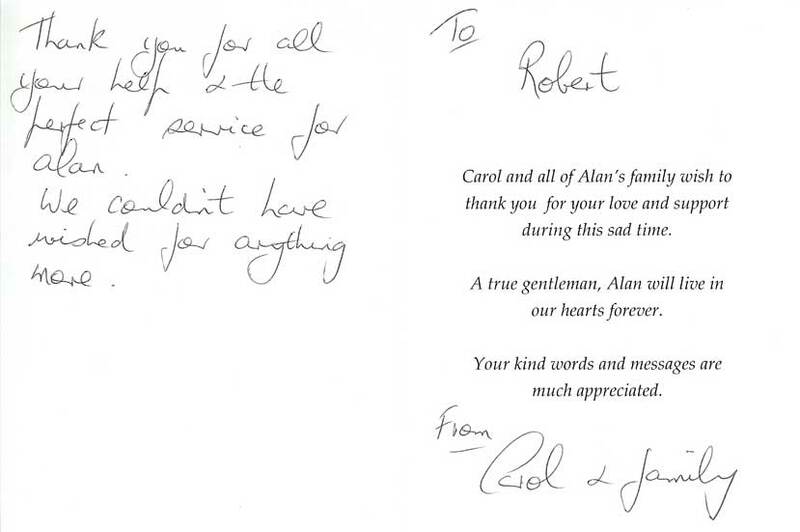 Unfortunately we did not get an opportunity to properly thank you after the wedding, so please accept our sincere thanks for all your help and providing such an excellent service. 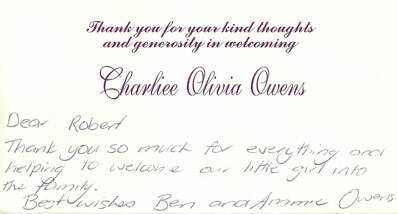 All our guests commented on how wonderful the service was, and of course, we enjoyed every minute of it. … We are now back in the depths of winter in England, but we manage to cheer ourselves up with the thoughts of that wonderful day. 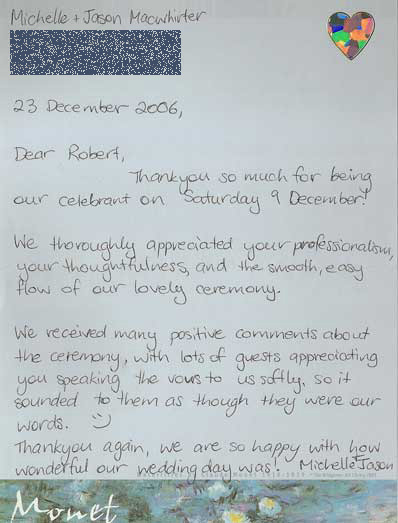 …I would like to thank you on behalf of Justin and myself for an absolutely lovely ceremony at The Villa on 19th October 2008. Many of our family and friends have commented on how professional though personal your service was and we are in nothing but agreement with them. We had a wonderful day and you would do it all again if you had half the chance! Once a year would be great … if it wasn’t for all the darned planning!!! On behalf of myself and Jennifer I would like to thank you for making our wedding the happiest and greatest day we have ever had. 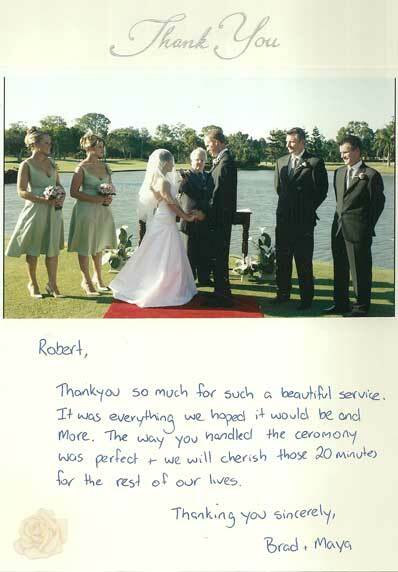 The wedding ceremony is forever etched in our memories and this was due to your professional help. 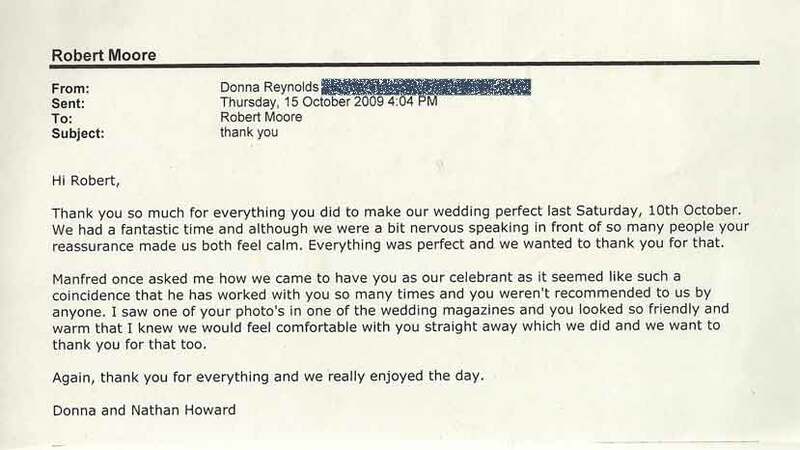 You made us feel very relaxed so we could enjoy the experience, thanks once again and see you in ten years when we renew our vows. Thank you so much for such a wonderful ceremony!!!!!!! You were wonderful, guiding us through one of the most important days of our lives! Thanks once again! 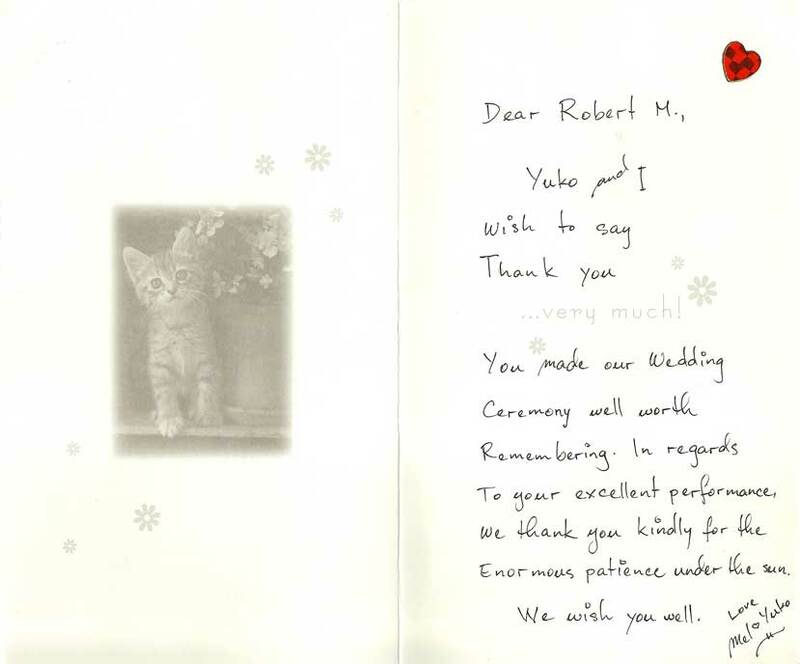 Thank you for helping & organising the service and also coping with us being Japanese. We really appreciate what you’ve done for us. Once again, thank you very, very much. 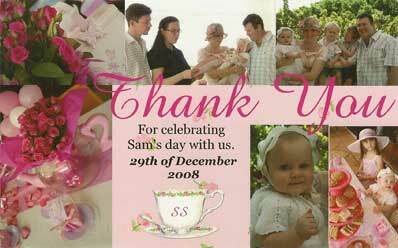 Thank you so much for your part in making our day so special. 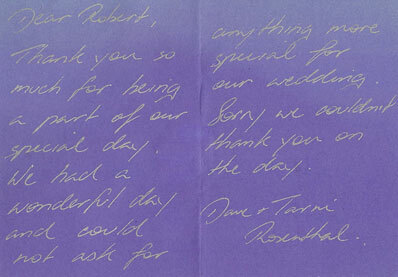 It was everything we hoped for and more, you made us both feel so special and comfortable. 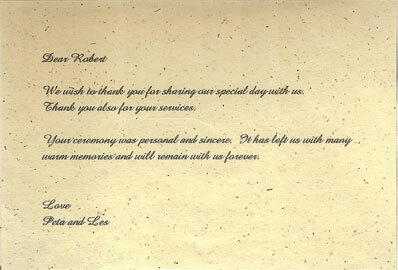 Just a short note to thank you so much for being our marriage celebrant. You did a wonderful job for us & it was so much appreciated. 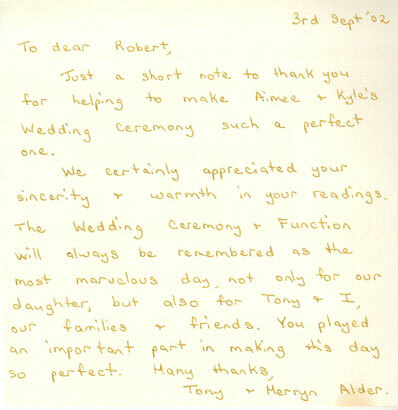 We felt the choices of readings was wonderful & very meaningful for us both. 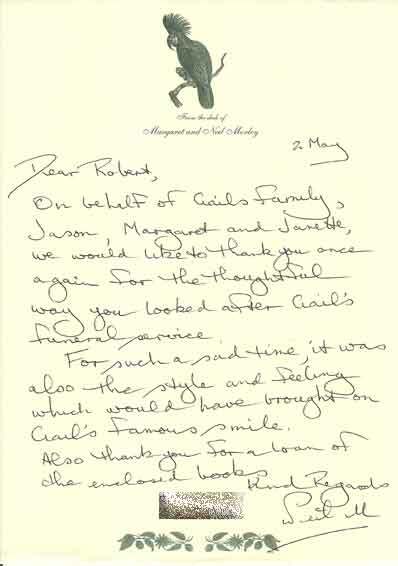 We couldn’t have wished for anything nicer. Many thanks again. Thank you so much for being part of our wonderful day. 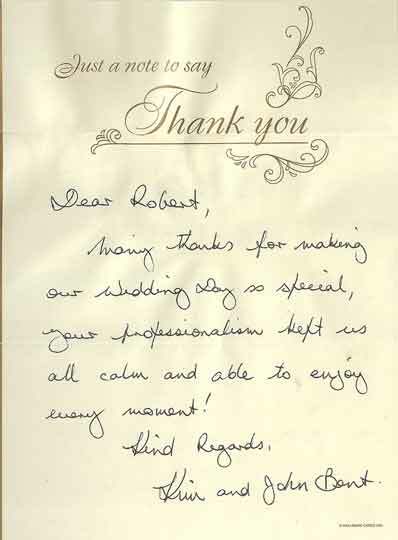 We loved the ceremony, The words were perfect and you were charming and considerate. 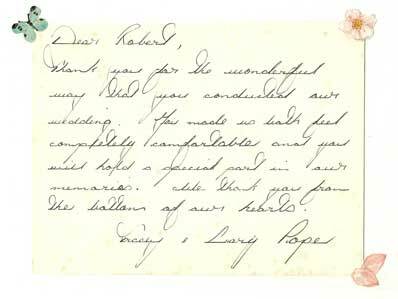 We appreciate all that you have done for us for that day and wish you continuing success. 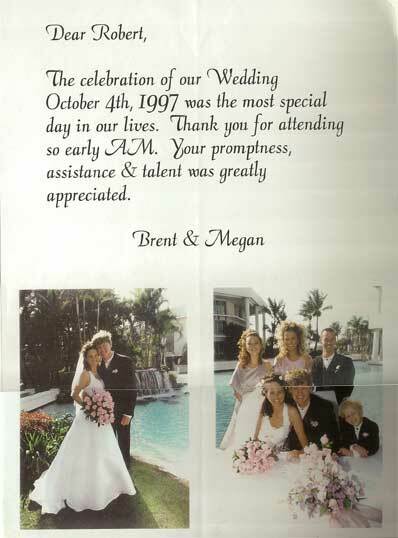 Thank you again for your participation on our very special day. 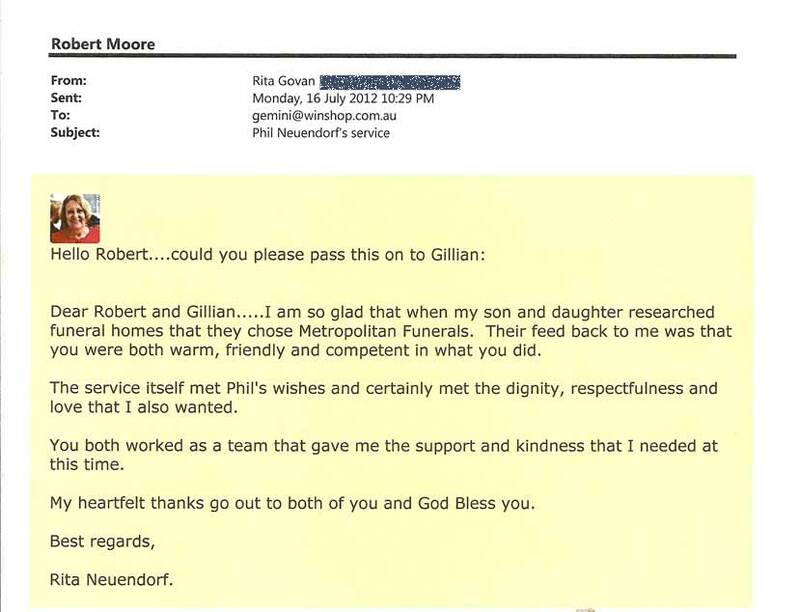 We are much humbled by your generosity and kindness. Your speech was fantastic. Again, thank you for all your help on the day. 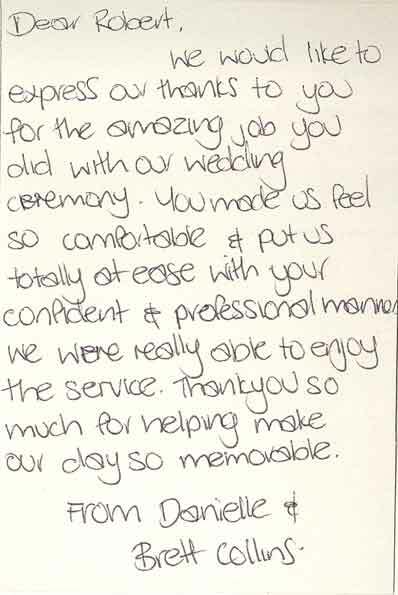 Jill & I would like to thank you so much for doing such a great job with our ceremony. 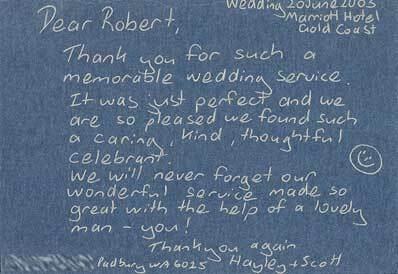 We’re very glad we used your services on our special day. Thanks again for a great job. 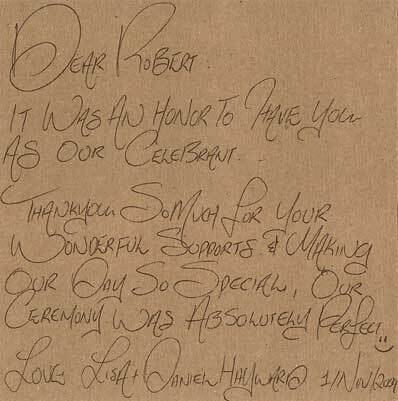 A very big thank-you from Peter and I for helping to make our special evening on June 14 as special as it was. 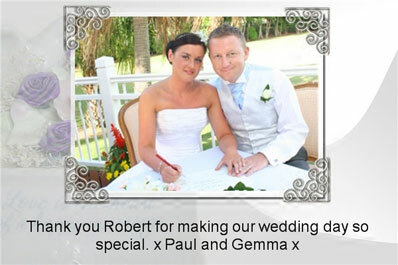 Robert, you are most professional in your area as marriage celebrant and congratulate you on a job well done. 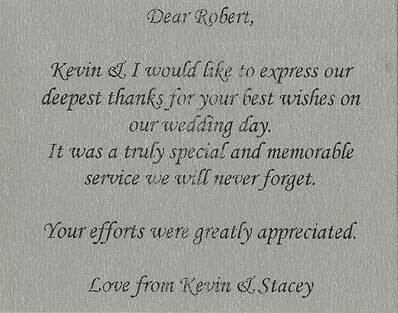 We would certainly have no hesitation in recommending your service to anyone wanting to make their special occasion just right. Thank-you so much for being the person to make us husband and wife. We couldn’t have chosen a better person to do it. It was a beautiful ceremony, lots and lots of tears & emotion from everybody. 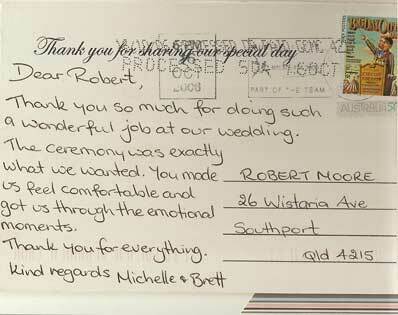 With this card we would like to thank you for the lovely ceremony you performed on our wedding day. We felt blessed to have such a perfect day & ceremony. 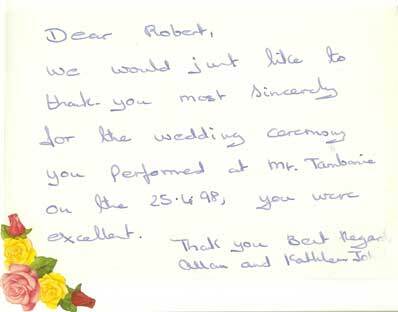 We would like to thank you for performing our wedding ceremony. 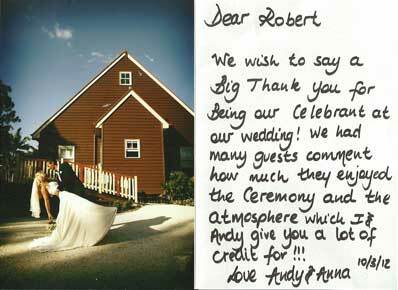 It was exactly what we wanted – special, intimate & relaxed. It was such a wonderful day & we were so glad you were part of it. Thank you. Thankyou for the lovely service for the funeral of my mother Elsie Fox. Everyone said how nice it was, even though you did not know us it felt very personal. Thankyou for being the Celebrant at my Dad’s funeral. It exceeded all my expectations. I could not have wished for better words that would suit my father. I had nine separate people come up to me & said it was such a good service. 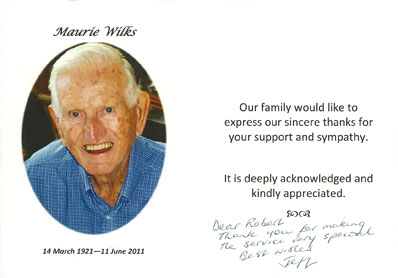 Thank you for assisting & making today go smoothly for a wonderful celebration & remembering of my Dad’s life. 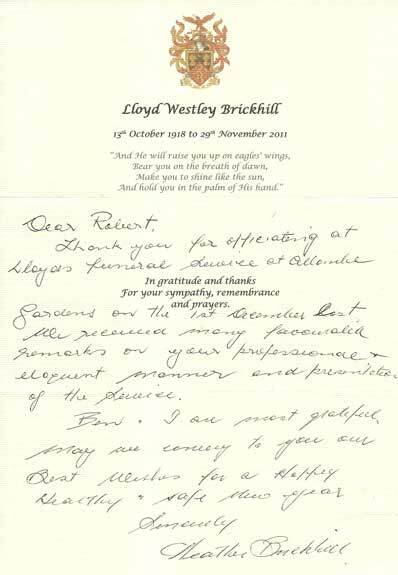 Thank you so much for looking after my dad’s funeral service. Your advice and guidance was much appreciated at this sad time.